Hello all! 2009 is here and I want to ask for a new body. What kind of body? This one! Hey Hum! I've been working out since I was 15, and using the same routine since I was 19, and it really works. But I'm an asthmatic and didn't have to lose any weight, so it doesn't include much cardio. What are your goals? I wish you all the best for the upcoming year!! Consider hiring a personal trainer for your first sessions to ensure your exercises fit your goals AND more importantly that you use the exercise machines properly. I do strenght exercise 3 times a week and cardio every day. Also am on strict diet for weight loss. At firstI had the trainer all 3 weekly machine sessions. Now I have cut him back to one maching session per week. Next I will cutback trainer to once every two weeks, and so on. The results have been very good. I'm not a professional trainer, but I have take several courses dealing with weight loss and exercising (i.e. Stress managment, weight training, yoga...) I would be happy to walk you through a good program that would fit your needs. ^_^ I'm not on MSN that much any more. I tend to stick to yahoo, but you can also shoot me an e-mail. Is this how you look like (will look like) ? I want to shape up too! I've been trying to work myself up to something similar to that hot man of a drawing myself since this past fall. I took a swimming class (because I've never known how to swim very well) and now what I can swim (not just doggy paddle) I have to say that swimming is a good way to start, plus you get to see a lot of hot guys too lol. But the easy fluid motion of your muscles in the water is a great work-out. WORK YOUR CORE. CORE CORE CORE. That's what everyone I've ever trained with says. If you're asking me seriously, tough-- like straight up? I'm so over abs. I find that no matter how many crunches / situps / core exercises I do, they never really show unless I flex it. The only time the abs are there by default is when I dont eat dinner and wake up the next day and my stomach is super skinny. That's the ONLY TIME. So, I've come to the conclusion that in order to get a 6-pack, you kinda have to starve. 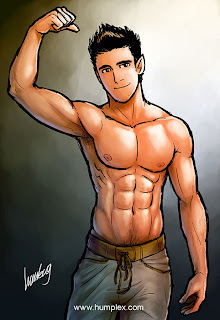 ALSO-- ever see dudes with abs but theyre asymmetrical? I'm not the biggest fan of that either. I'd prefer a hard flat belly to crazy asymmetrical abs. ALSO-- lots of models these days spray and photoshop abs in. i wish I had a body like that, too, but I hate exercising. Funny enough, I'm still just above underweight. haha. Best of luck! what yous should do is..
why..because it can loose your metabolism and also it will make you feel bad. ok for example you eat 2 cups of rice or mashed potatoes every meal(breakfast,lunch,supper)total of 6. try to practice yourself try eating 5 then next week 4 and so on..try eating green veggies like vegetable salads or tuna diet.for bread try wheat bread. So yer goal is to look like that? PFFT yeah right. Yeah, me too.. (sigh). Any how, you have to know what weight is considered healthy for your height. Then, talk to a nutritian and or doctor so it can tailor a diet for you, or if you need some prescription for helping your diet. And a personal trainer that you can trust (and not just ogle). And above all... your expectations should match your bodytype. to get abs THAT defined, you really have to eat nothing and run all the time. when you do eat, make sure its a lean protein. dont skip breakfast. LOTS of cardio. if you want abs, you have to trim that thin layer of fat on your stomach, so only diet and cardio will do that. try HIIT (google it) and alternate cardio with lifting and rest 1 day a week. its HARD work and slow progress, but worth it in the end. For excellent information, buy the book BODY SCULPTING BIBLE FOR MEN. take up muay thai kickboxing. I went from 220 lbs, 21 % body fat, to 175 lbs 12% body fat in one year. This is a bit late but, google "sparkpeople." After just one of there any givin excercise sessions that target everything from your thighs to your upper body you'll be sore for a week. I myself have lost at least 15 pounds and I started last month (but I'm was kinda chubby to begin with so it was kinda easy). I'm a trainer. bigfrog76 on DA..
so how has the program been so far? since it's been 7 months? I don't really love to exercise,but I do dance a lot.Although it won't burn as many calories or get you muscles,it is a kinda fun way to work up a sweat. Looks like plenty of people responded to your request for a trainer but if you want your body to look like this character it would involve a lot of cardio, looks like this character has more of a lean swimmer's body than a gym bunny body. I could talk to you about getting there because me myself lost over a 100 pounds in the past 2 years. So I think I have a very good idea of how to get that body because I kind of have that body. hehe. so if you want to chat a bit about it, my routine won't have you going GOD DAMMIT I got to go to the gym. haha.